Mike Soehnlen remembers his three-year-old gelding "Cravin For Cash" as a sweetheart of a horse who dominated races at Northfield Park and other tracks. Mike Soehnlen remembers his three-year-old gelding "Cravin For Cash" as a sweetheart of a horse who dominated races at Northfield Park in Ohio and other tracks. "When I first laid eyes on him, he was a big, beautiful horse and very gentle. He was like a gentle giant. He would lay his head right in my arms and I would just pet him," Soehnlen said. The horse was one of 15 that were released from a barn at the Stark County Fairgrounds around 5:30 a.m. Monday. Police, firefighters and fairground employees spent the next two hours rounding up the horses that had wandered into Canton and Perry Township neighborhoods. But Cravin For Cash made his way onto Myers Lake in Canton Township and fell through the ice about 200 yards out. Despite a valiant effort by Canton Township firefighters, the horse could not be saved. "I'm used to him alive and happy and healthy and to see him dead like that, basically frozen, and have to pull him out," Soehnlen said. Christopher Ford, 28, of Mansfield, is accused of opening the stalls and letting the horses out. He told police the animals "wanted to be free." Ford appeared in Canton Municipal Court on Wednesday and was charged with breaking and entering, disrupting public service, inducing panic and and possession of drugs. Officers found two types of marijuana on him. His bond was set at $100,000. Soehnlen said he doesn't know Ford and fairgrounds board members were not aware of him prior to Monday's incident. Police said more charges are possible and the racehorse owner believes animal cruelty would be appropriate. 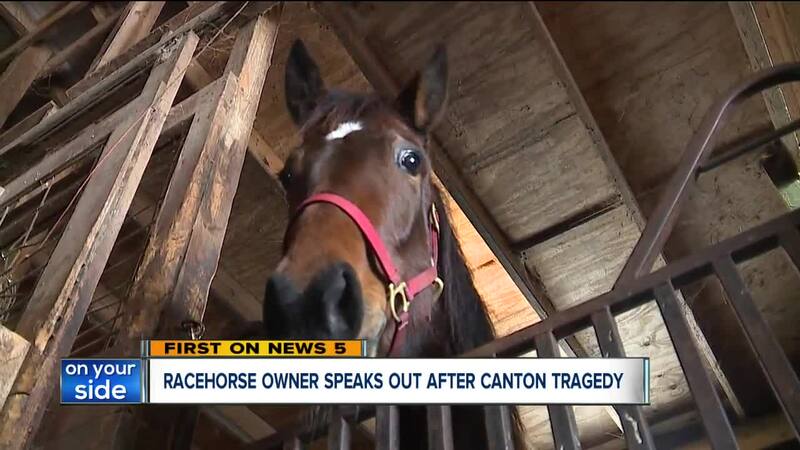 "It's extremely cruel to turn a bunch of horses out of the barn in the middle of the night and have them running all over Canton, Ohio," he said. Soehnlen owns nine of the other 14 horses and said all of them were stressed, but have been checked out by a veterinarian and are doing okay. He's grateful for everyone in the community who helped round up the horses, and as he remembered the horse he simply called "Cash", he had a final message. "We don't need a tragedy like this for us to keep being good to each other, showing love and compassion everyday."